Computer electrical diagnostics and system repair can get quite complicated for some cars and therefore expensive. For this type of testing and auto repair Tempe it’s more important than ever to find an auto repair shop that can offer top notch repairs at a fair price. We realize your vehicle represents a major investment, and the level and quality of its service shouldn’t be left to chance. Selecting a mechanic can be a challenging. Finding one that’s trustworthy and honest sounds almost impossible! You deserve dependable, honest service…and that’s priceless. It’s also exactly what we provide to our clients in the Tempe AZ, Chandler AZ and Phoenix AZ areas. 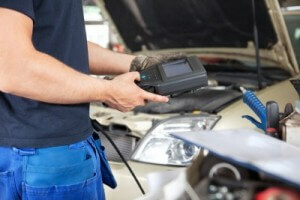 If you suspect you’re having electrical problems, bring your vehicle in for a free inspection and estimate. We often find it can be something simple. However, waiting can often increase the problem and how much it costs to repair it. We have a well-deserved reputation for quality auto parts and auto repair service, especially when it comes to computer electrical diagnostic testing and repair. Contact us today and set up your free inspection!